3 - 4.............Graaf Quirinus van Neêrlands Stam. 5 - 5,5..........Ali von Langenhorst. 3rd place at the Deutschen Meisterschaft in 2006. 3rd place at the IDC Weltmeisterschaft in 2006. 2nd place at the Deutscher Meisterschaft in 2005. 13th place at the VDH-DM in 2005. Participant in the IDC Weltmeisterschaft in 2005. 19th place at the FCI-VDH-IPO DM in 2004. 5th place at the IDC Weltmeisterschaft in 2004 and Mannschaftsweltmeister in 2004. 7th place at the Deutschen Meisterschaft in 2003. Hajo vom Aurachgrund was the winner of the D.V. Meisterschaft in 2004 with 291 points and passed the ZTP with 1A rating for character and SG for conformation. Hajo's sire, Baron vom Lechfeld, was a two time winner of the D.V. 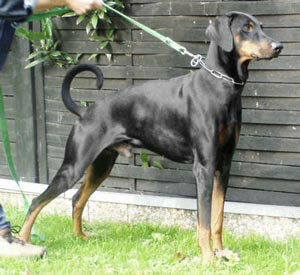 Meisterschaft and also sire to Mona vom Edertal, who in turn was a three time winner of the D.V. Meisterschaft and two time IDC-Weltmeister. Hajo's dam, Debby vom Aurachgrund, was the Bayerischer Meister in 2001 and 2003 as well as competed in the D.V. Meisterschaft.